I've only recently purchased some of Elzybells whimsical and fun rubber stamps. I was first introduced to this stamp line by Karen, a Scottish friend who was in my crafting group in Abu Dhabi. Once we moved to England, I didn't forget Elzybells! I looked up the Elzybells site and HAD to purchase some of the stamps for my very own! I love that I can purchase these stamps as unmounted, as almost all of my rubber stamps are off their wooden mounts (a great space saver!). I've been very busy making Christmas cards lately, and Elzybells have taken centre stage in my card designs. You can see that I used this same watercoloured image in a previous blog creation. Thank you for stopping by to have a look at my creations! 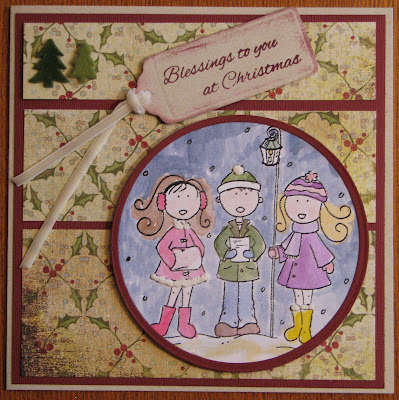 Beautiful card and love how you made three cards with this stamp and they are very different. Love how you coloured the image.